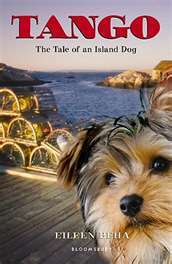 Tango: The Tale of an Island Dog is a cute story that will appeal to dog lovers. Tango is a Yorkshire terrier accustomed to the good life. But when he’s swept off his yacht and washed ashore on Prince Edward Island, he finds himself in need of a friend. Fortunately, he finds lots of them. Miss Gustie, with her gruff ways, young McKenna, in need of a family, and Beau, the aging fox. But not all residents of the island are friendly. The gang of cats who live in the Pitiful Place are up to no good, and Tango better watch his step. In his quest to get home, Tango find he has everything he desires right on the island. While I appreciated the animal personalities, the writing didn’t grab me. In fact, I found it disjoined, with too many perspectives coming at me at once. It took me most of the book to sort them all out and get a feel for who they all were. Often I was surprised by some bit of information that hadn’t been built up to very well, something narrated in rather abruptly. And I felt the dialogue was forced, even stagnant in places. I just wasn’t impressed with the story’s flow. Sounds like it would be a better movie than a book!